NEW BEDFORD, Mass. 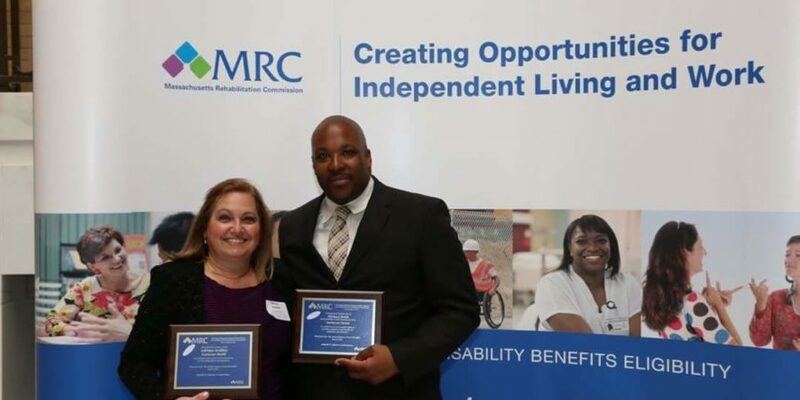 — Southcoast Health announced today that Adriana Avellino and Michael Bobb were recently honored by the Greater Boston Employer Advisory Board (GBEAB) to the Massachusetts Rehabilitation Commission (MRC) for their efforts to promote employment opportunities for individuals with disabilities. At the GBEAB’s 19th Annual Employer Awards Breakfast on June 9, Avellino received the Distinguished Consumer Award and Bobb was a Distinguished Employer Award recipient. Avellino, who is deaf, works in the café at St. Luke’s as a barista. Bobb has more than 17 years of experience as a manger in the food service industry, and has served as the manager of the St. Luke’s Hospital cafeteria since 2013. The Annual Employer Award Breakfast is an opportunity for greater Boston area business to hear first-hand about the various ways the MRC assist companies in diversifying their workforce. The MRC provides award-winning services under the Vocational Rehabilitation division by building relationships with companies, understanding their needs and culture of the industry, and providing qualified candidates with disabilities who match the job expectations. For more information, visit mass.gov/mrc.